It’s that time of year again – icy roads, whiteout conditions, and freezing temperatures are going to start popping up all over Long Island. Savvy drivers are going to want to do everything they can to stay ahead of the problems that inclement weather brings, so it’s time to make sure that you’re at the top of your driving game this winter. 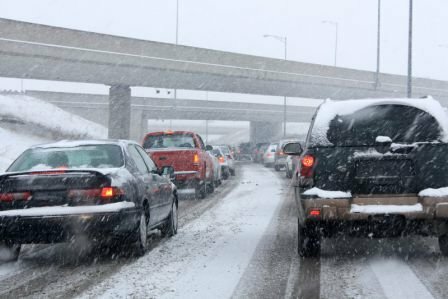 Here at Westbury Toyota we’ve done a little research in order to share with you four crucial winter driving tips that will make your daily commutes much safer and far less stressful. In the interest of saving time, most of us only take the time to brush off snow from our windshields before we head off in the morning. This does us no favors, as Peter Cheney from The Globe and Mail explains, because the snow we leave on the hood or the roof can fly up to obscure our view. Always allow some extra time before you leave so that you can do a thorough removal of built up snow to ensure that you won’t be taking any unnecessary risks when you drive. A lot of people pass on winter tires because they think it’s an unnecessary cost, but the fact of the matter is that snow tires make a huge difference in improving your vehicle’s traction on snowy/icy roads. There’s a common misconception that all-season tires are just as good but they’re not – the only tires that are completely reliable in winter are the ones that are built for the season. If you want the best traction possible, splurge on a set of winter tires (and don’t be afraid to get the kind with studs if necessary). Perhaps the best wisdom to take to heart when it comes to winter driving is to use common sense and drive slowly and with care. If it’s icy, accelerate/decelerate and take corners with caution. If there are whiteout conditions, make sure to drive at a speed that is appropriate with how much your vision is impaired. Give yourself plenty of time to brake when approaching intersections or stop signs. While driving cautiously might add some extra time to your commute, it’s important to consider the alternatives. Arriving a few minutes later is always going to be better than getting into a wreck or hitting the ditch. We here at Westbury Toyota know just how stressful winter driving can be, and that’s why we’ve shared these four important tips with you. We want everyone to stay safe during the cold weeks ahead. Remember to give yourself extra time in the mornings or evenings to allow for snow removal, slower driving, and any potential traffic issues you might come across. It’s a small adjustment to make in exchange for safer daily commutes.